Kilmarnock have completed the signing of striker Allan Russell. 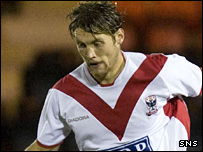 The Ayrshire club failed with a bid sign the 27-year-old in January but sealed the transfer after Airdrie United's last game of the season. The former St Mirren player, who struck 26 goals this season, has moved to Rugby Park after his contract expired. Killie manager Jim Jefferies said: "It's a two-year deal with the option of a third year if he meets certain criteria in the second season." Russell's arrival will go some way to making up for the sale in January of Colin Nish to Hibernian. But Jefferies stressed: "We still need another striker or maybe even two more as we need competition for places and some players may move on." It is still uncertain whether the likes of Paul Di Giacomo and David Fernandez will remain at Rugby Park. "There are one or two strikers where we had options on their contracts if they played a certain amount of games," Jefferies said. "Injuries have stopped that happening. But, because of the season we have had, we are hoping to tie them up and renegotiate new contracts. "If we can't agree terms, they will go where they accept better terms."